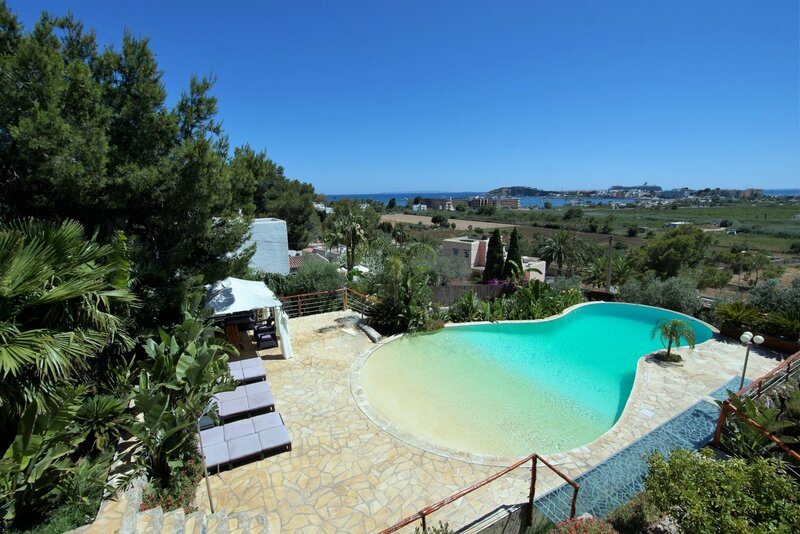 Renting a legally registered villa in Ibiza ensures superior service, comfort and peace of mind. It is a true fact that many visitors to Ibiza experience problems with the villas they book for their holidays. They may find that the villa is not up to an acceptable standard, that it is not properly cleaned, or that there is no hot water etc. In the very worst of cases, the owner is not there at the airport to meet them, as expected, and when they discover that the telephone number they have been given is non-existent, the awful realisation dawns that they have been conned. For peace of mind, this holiday-maker's nightmare can easily be avoided, at no extra cost, by making sure you book a legal villa through Ibiza Spotlight, which only works with legally registered tourism villas. Country Villa Can Tomás (Ref. 052) near to San Antonio, sleeps up to 10 people. What does renting a legal villa through Ibiza Spotlight mean? All of our legal villas have been accredited by and registered with the Tourism Association of Ibiza, which assigns a registration number to each villa. They have been fully inspected by Ibiza Spotlight's experienced villa experts, meaning you can rest assured that high levels of quality, service and facilities are guaranteed, as are the officially required safety standards. Should an invoice be requested, then the villa owner is legally obliged to issue one to the client. Our professional, multi-lingual team will help you find the perfect villa in Ibiza to suit your holiday plan. Our user-friendly search engine allows you to limit your search to your specific criteria. On request we can supply you with details of all security features in every one of our villas; for instance. is the property gated with a secure intercom? Does it have a safety deposit box? Is the pool fenced for child safety etc? These issues are, of course, of vital importance to any holiday-maker and whilst we here at Ibiza Spotlight consider them to be absolute basics, they are worryingly not necessarily guaranteed with illegal villas. Once you have decided on a villa and availability has been confirmed by the owner, you will be issued with an official confirmation voucher, which is a firm reservation between you and the villa owner and provides you with all the contact details you will need. Should you have any queries or requests before your arrival, our helpful team will liaise with the owner on your behalf, and during your stay they, together with the villa owner, are on hand to answer any questions. Sea view Villa San José (Ref. 048), boasting spectacle views over San Antonio bay, sleeps up to 8 people. To enhance your stay on the island, Ibiza Spotlight has selected a series of services tailored to villa guests. You can have your car or buggy delivered to your villa, enjoy a massage under the shade by your pool, get yourself in shape with Pilates or a Personal Trainer or indulge in a truly pampering experience in the privacy of your holiday home. Our legal villas are available all over Ibiza, whether you prefer to be inland or close to the sea. The choice is yours!